October???!? I guess I’ll be the eleventy-zillionth person in your blog or social feed to exclaim, How can it be October already? 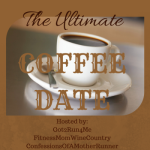 But here we are, anyway: it’s the first Saturday of October, which means it’s time for the Ultimate Coffee Date hosted by Coco, Deborah and Lynda! So let’s grab an afternoon cup of coffee and chat! If we were having coffee, I would tell you… that I am IN the 2016 Boston Marathon! Boy, did it come close… There was so much interest in the race this year, that time cutoff ended up 2:28 minutes below the official BQ standard for each age group. Which means that, with my 2:36 cushion, I squeaked in by 8 seconds. When you think that I could have lost that time at an aid station or walking for a bit, or with a porta-stop… I will never, ever again underestimate the importance of a second — or eight. A little confession, though: I ordered this Boston Qualifier tee from Adidas even before I knew for sure that I got in the race. I would have worn it with pride, regardless! If we were having coffee, I would tell you… that I am running Ragnar Napa Valley this month, with Team Nuun! I am super-duper mega excited to run, ride, sleep (?) and repeat the beautiful 200 miles from San Francisco to Calistoga again, and with the support of a company whose product I love and use daily! Thank you, Nuun Hydration, for the opportunity, and I can’t wait to meet my van-mates and get going! If we were having coffee, I would tell you… that I recently started reading Bowerman and the Men of Oregon: The Story of Oregon’s Legendary Coach and Nike’s Cofounder . I’m late to the party – the book came out years ago – but it’s fascinating, especially the parts describing how Bowerman developed his training methods. And I haven’t even gotten to the part where he is making the prototype Nike flats out of rubber melted in his wife’s waffle maker! If we were having coffee, I would tell you… my dirty little secret: I hate pumpkin spice latte! I really do! I’m not a huge fun of pumpkin-spice anything, really, other than actual pumpkin. My dentist a couple of years ago discovered this the hard way, by using pumpkin-flavor paste to clean my teeth, without asking first if that’s OK. I hope she knows better now! What would you tell me if we were having coffee together? Congrats for Boston, so exciting! And placing in a race must be so exciting! I hope you enjoy Ragnar, I would really love to do that event one day! Forgot to say that I have done 2 Ragnars but Napa is on my wish list for next year. Can’t wait to hear about it. I did that one two years ago – it is BEAUTIFUL; it rained all night long, though, and through the next morning. I’m hoping for dry weather this time around 🙂 We should make a SKIRT team for that one next year and rock it! Congrats on getting in to Boston and your 3rd place finish! I like PSL but only with one pump of the syrup – I just don’t like my coffee too sweet. Thanks for joining us for coffee! Yayyyy! Congrats on qualifying for the BQ marathon!!! You’re killin’ it out there! And hooray for Napa Valley! I miss CA so much! Thank you! California is, indeed, a magical place. I would miss it tremendously if we had to move! Thanks for stopping by!